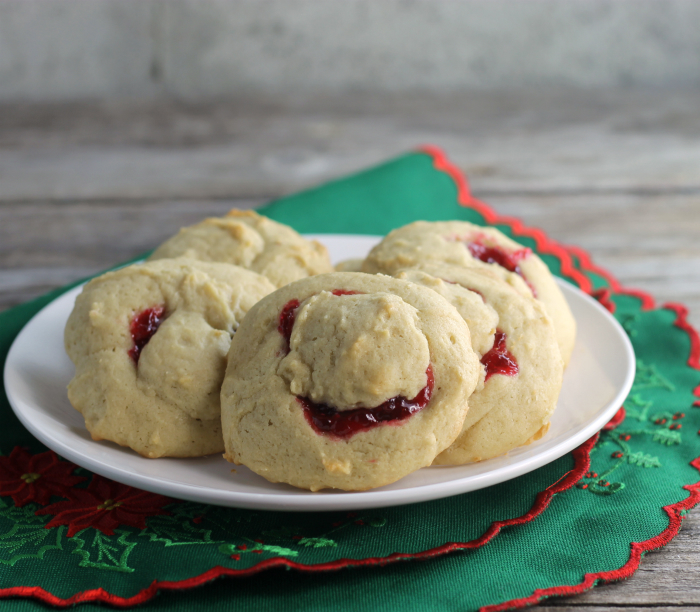 Cranberry dab of dough cookies, soft cookies perfect for the holidays. My mom made the dab of dough cookies every year for Christmas. It was one of my dad’s favorite cookies during the holidays. The dab of dough cookies were special Christmas cookies, they were never made at any other time of the year. Her version of the cookies had a filling of dates instead of the cranberries. Personally, I love the date filling and if it were up to me these dab of dough cookies that I made would have a date filling. But I am quite sure that my family would turn their noses up to this type of cookie. And since I love cranberries, it’s the next best thing. Well, I would have to say that the cranberries measure up quite nicely to the dates. 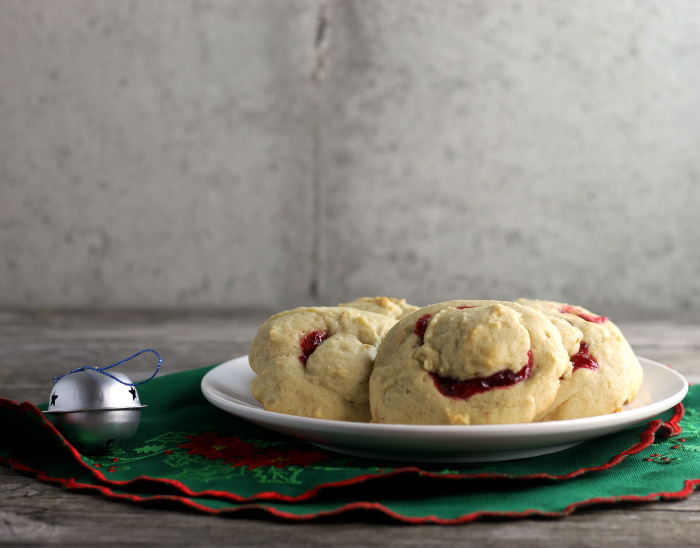 The cranberry filling gives a whole new flavor to these dab of dough cookies. Even though my mom made these cookies for all those years, she was not a fan. She too is not fond of the date filling. So I decided to surprise her with a sample of the cranberry dab of dough cookies. She liked the twist that I made to my dad’s beloved cookies. My dad passed away over eight years ago and I found myself wondering if he would have loved these cranberry dab of dough cookies. I am not sure, he wasn’t one for change, but then again I believed he enjoyed cranberries. 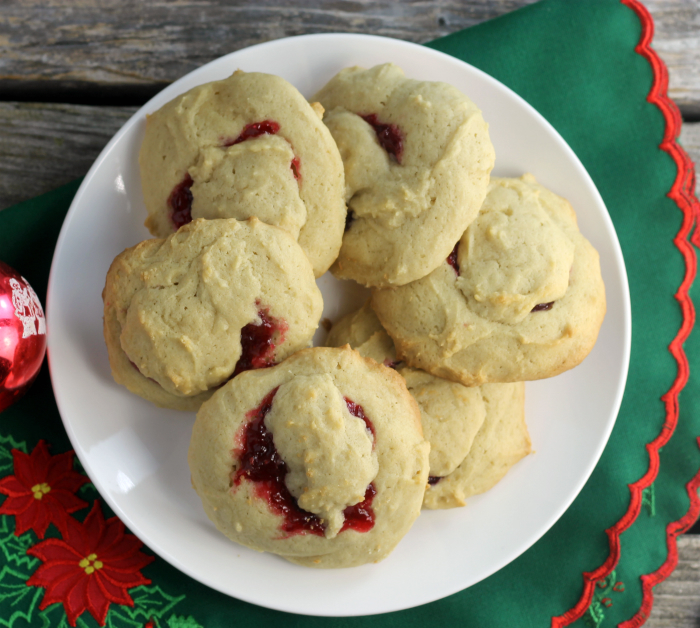 The cranberry dab of dough cookies are the perfect cookie for the holidays. 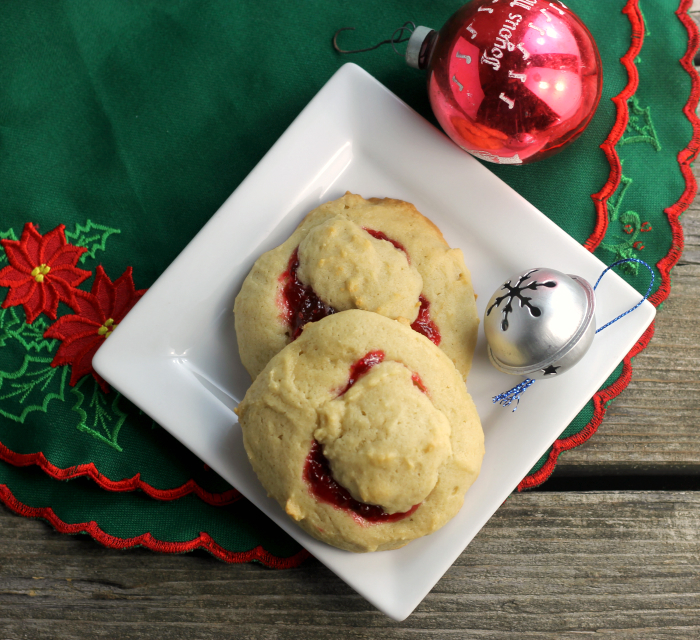 The cranberries give the cookies a festive look, with their bright red color. The cookies are called dab of dough because of the dab of dough that is set on top of the cranberry filling. The soft festive cookies may become your favorite holiday cookie. I hope you give these cranberry dab of dough cookies a try. In a medium saucepan combined all of the ingredients. Bring to a boil over medium heat. Continue to cook until the mixture reduces by half or a little more and become very thick (jelly-like). In a large mixing bowl beat the butter and sugar together with an electric mixer. Mix in the vanilla and the sour cream. To this mixture add the boiling water and mix until combined. Sift together the flour, baking soda, and salt. Add this to the dough and mix until well combined. The dough will be very soft, but that is how it should be. Drop the dough by teaspoons onto the prepared baking sheet. With the back of the teaspoon make a small well in the dough. Take a dab of the cookie dough and set on top of the filling. Place the cookies in the preheated oven and bake 12 to 14 minutes or until the bottoms are slightly browned. It is the Christmas cookie time of the year. For another perfect Christmas cookie click here. So yum with cranberry filling! Love the name of these cookies. These cookies are adorable! And the cranberry filling doesn’t hurt either! What a neat recipe! I’d love the date version just fine, but cranberries do look more festive. Really fun! Thanks so much. What darling cookies! Thank you for sharing your family recipe! I never heard of these before – love the cranberry filling! So festive. I love the idea of using cranberries in these cookies, they look so festive and I am loving how these are…dab…very cute! I think holidays are made all the more special when we enjoy recipes that have been enjoyed over the years. I’ve never heard of dab of dough cookies but I’m sure I would enjoy them, especially with the cranberry.